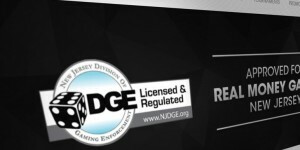 New Jersey online poker players no longer have to question whether a network they come across is legal, the state’s Division of Gaming Enforcement (DGE) releasing a “Licensed & Regulated” logo this week that is required to be displayed effective immediately on authorized iGambling websites. Market observers believe the emblem might lead to increased revenues for the state and higher participation among residents who have been weary of playing on an unregulated platform. Since legalized Internet casino gambling was signed into law on February 26, 2013, online poker has struggled to meet pre-legalization forecasts. To date, the game accounts for roughly 25 percent of overall iGambling revenues. David Rebuck, director of the DGE, said in his annual review that the “implementation of an approved Division seal” would be issued to clear any player confusion when visiting a new gambling website. After four months of dwindling revenues, the market bounced back in July and August, a welcomed change of course as the fall and winter months approach, a traditionally strong period for Internet poker and gambling. For poker to blossom, new player account creation is needed. Rebuck hopes his agency clearly identifying a platform’s legitimacy will attract a supplemental flock of gamblers. Those who might think the DGE logo is just going to be yet another insignia on the already overcrowded online gambling webpages should consider that many Internet users are still rather naïve when it comes to the net. Just this week, hundreds of thousands of Facebook accounts posted and shared a copyright and privacy notice after the hoax went viral across news feeds. Though the social media company publicly denounced the hoax and a simple Google search turned up a plethora of stories confirming its falsehood, users still continued to copy and paste the announcement. Ideally, the DGE logo will aid those being preyed on in New Jersey by illegal offshore sites. The primary objective for the New Jersey DGE is to first and foremost protect citizens followed closely by collecting revenues. Blocking illegal sites from its jurisdiction plays critical roles in both goals. Speaking at the Global Gaming Expo, American Gaming Association (AGA) President Geoff Freeman said that today online and offshore betting is the most common form of illegal gambling in the United States. Freeman stated the “industry that operates in the shadows” is responsible for negative perceptions of gambling as a whole among certain policymakers. “Illegal gambling affects the credibility of our industry, and that credibility is directly tied to the public policy that we confront,” Freeman attested.